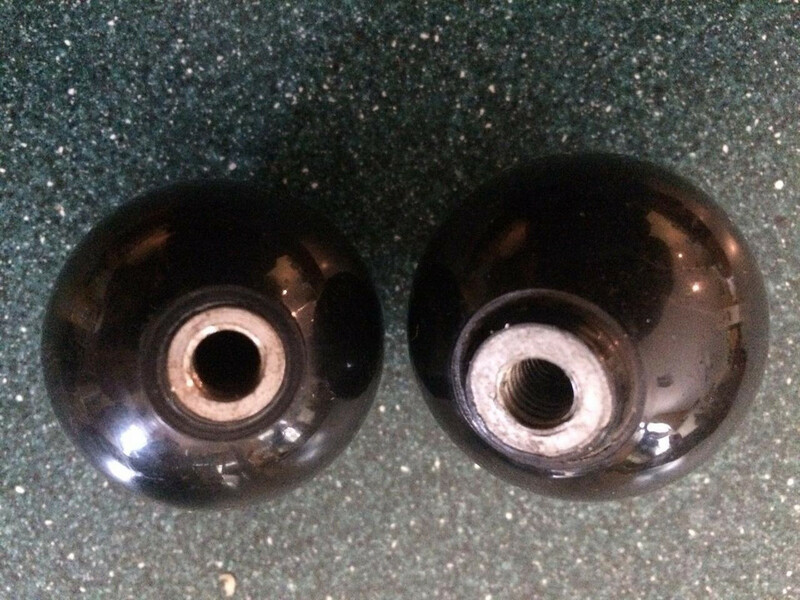 The round plastic one was Factory Fit. The leather one is after market and not particularly nice - the Jaguar script is wrong. Round plastic original is also v heavy... Perhaps it has a lead core? Deliberate, to give more momentum when changing gear. I love that attention to detail. Angus told me that people with lightweight aftermarket knobs have sometimes thought their box was faulty - so it clearly makes a difference to the throw. The OEM was the first thing lot of US Dealers took off to put a custom one on instead - usually that one or the type with check pattern badge. Heavy is good for change action and to damp high frequency buzzing if it occasionally resonated at speed. 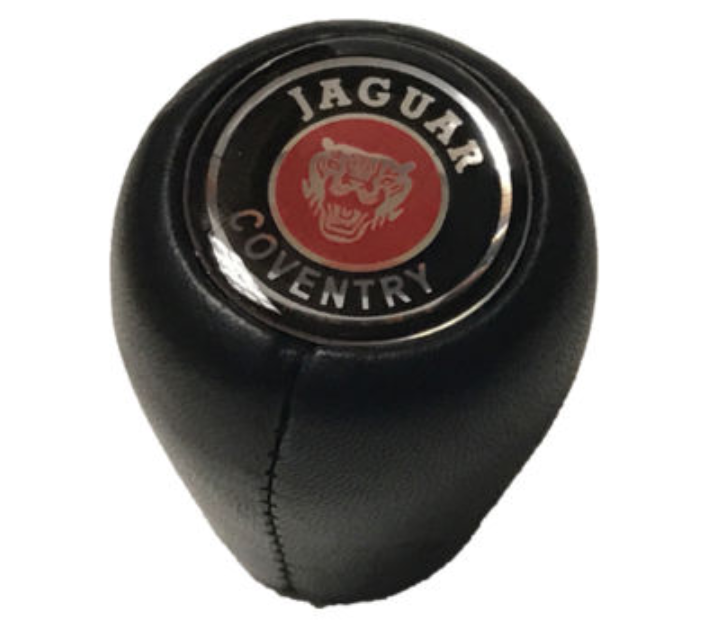 The world record must go to the 5-speed Getrag fistful they used on XJ and XJS from the mid 80s. It's like holding hands with a beef tomato. 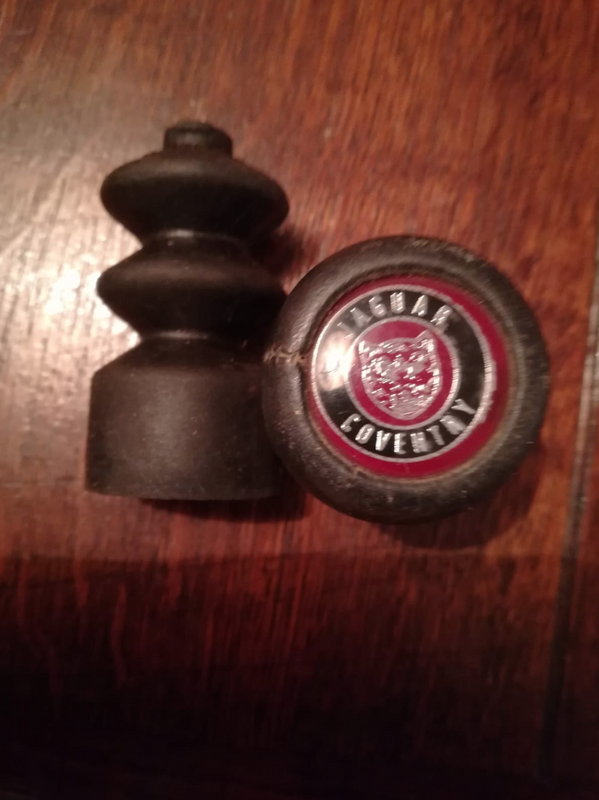 Thank you for your insight everyone, I have tracked down the knob that 'apparently' came fitted to the car when it was bought by my father in '65 from dealership in Park Lane London (sorry about image quality). That's as far as he can remember, anyway. 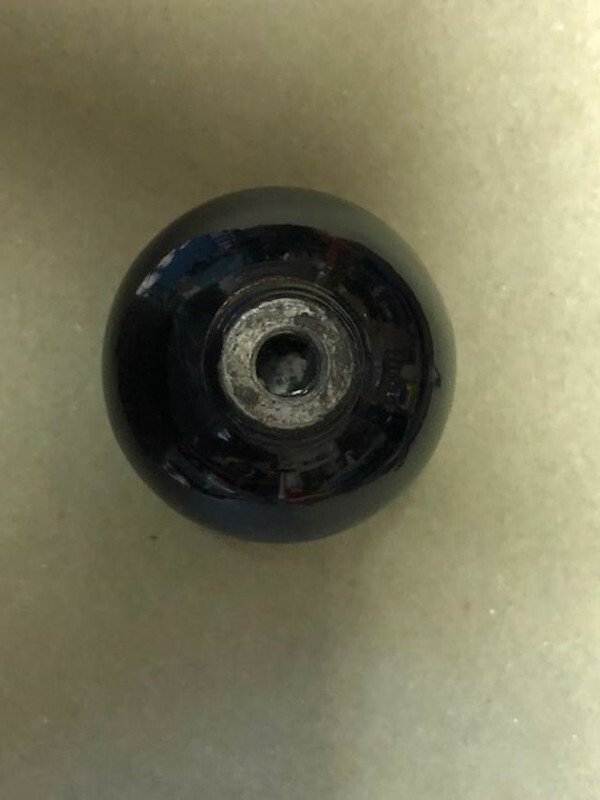 I have always had my doubts and as a child, remember more of a checkerboard pattern on leather knob as mentioned by Peter, but I'm not sure either. I have bought a standard replacement from SNG Barratt for about £20, it looks like the original, but not sure how it will weigh. 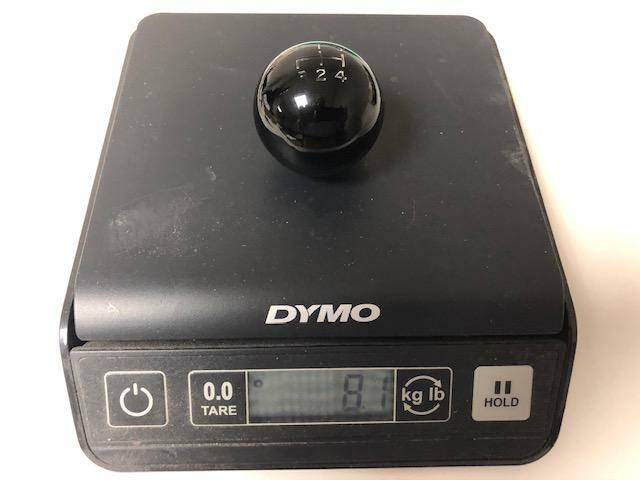 The originals weigh about the same as a billiard ball. They are a heavy Bakelite type material with a brass core. 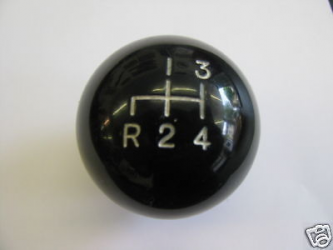 My knob is original, from 1965, and I'm very happy with it. Not sure whether youre wandering off topic or not?! I've had a lot through my hands with selling gearboxes and never seen a brass one. Not saying they don't exist but it'd be an odd choice for an inexpensive non-visible, non-corroding, non-electrical non-precision piece (whereas pot metal, steel or cast iron would not be). I did find something interesting though. These two (I usually have a couple more) are repro left and original right. 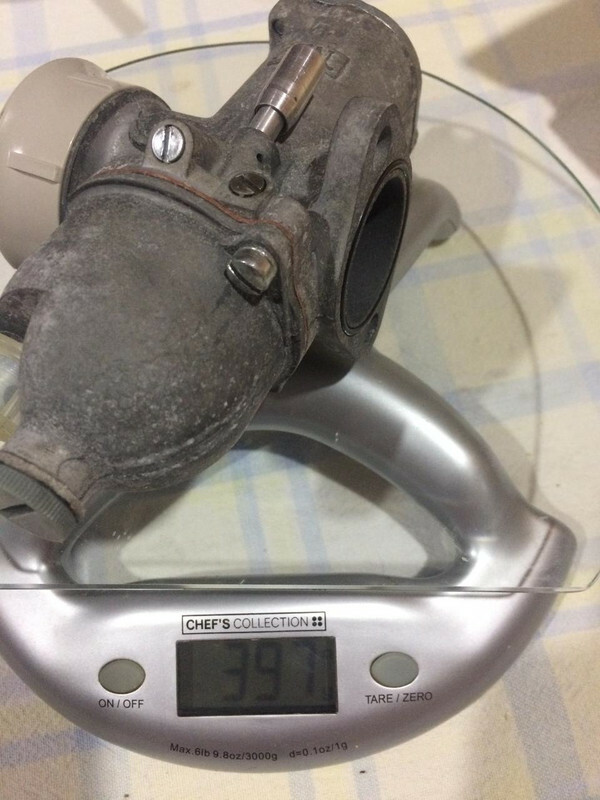 The OEM is larger and weighs half a pound/8 oz, where the smaller one weighs 5 oz. To my surprise, however, the heavy OEM is pot metal (non-ferrous) whereas the repro is the magnetic one. I guess it's easier to CNC a mild steel sphere these days than to tool up for moulds? The difference in size and weight i s very notable in the hand. I'd expect that some who spend a decent chunk of cash to 'upgrade' from a wood or leather knob to a repro might be underwhelmed by the modest difference in gearchange feel. Just goes to show you should never throw old kit away until you're happy with the replacement. Ahh, I assumed the weight came from brass, never really bothered to check. On the other hand brass is non magnetic and I would have thought pot metal would not have that much weight. Interesting. I have the wooden flag type one. Shall I worry? No, it‘s the cars own history, and if it worka, it‘s allowed to stay there. In fact on the ebay pics it was intact, when the car arrived it was missing, until I found it in pieces under the seats, so I could restore it „as new“. Some of the zinc alloys are heavy. The weights on pool vacuums, for example. 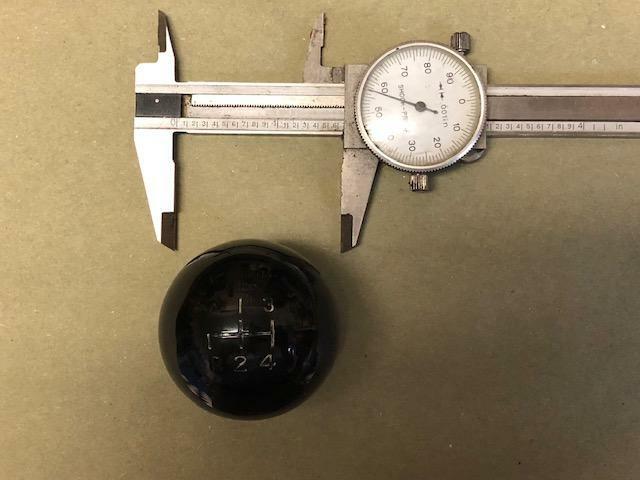 As far as I'm aware, an original shift knob measures approximately 1.655"ish in diameter, weighs approximately 8.1 oz and the core is non-metallic. Non magnetic, rather than non-metallic, but yes, I agree with all parameters. I said 8 oz to round down - it was 8.1 oz same as yours.